A wedding ring is a metal band worn on the base of the right or left ring finger. An exchange of a wedding ring between husband and wife is a symbol of a life-long contract in the modern days now. At Michael Trio, we offer an eclectic variety of His & Her wedding bands, with some collections of engagement rings for her that will complement the wedding band in shape/size. If you have already purchased your engagement ring elsewhere, fret not. You can bring your engagement ring to us and our team of designers will provide you with customised designs to match your engagement ring. Michael Trio offers 2 types of wedding rings: with and without diamonds. The plain wedding band holds its own appeal to those who feel an affinity for tradition and history. A wedding band without diamond does not necessarily lose out to one with diamonds too because we use a variety of finishing and texturing to bring life to a simple band. Michael Trio offers wedding bands in white gold, yellow gold and rose gold (18 karat or 14 karat) to suit a variety of tastes and preference. Men today have more choices than ever for wedding bands. 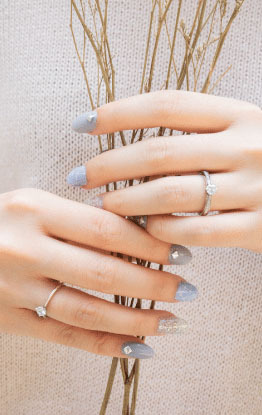 From the simple textured gold ring to bejewelled designs set with a simple diamond or more. Explore our collections for more options. Symbolising everlasting love, eternity rings are growing in popularity amongst the ladies. Diamonds in claw setting allow more light for maximum brilliance while channel setting offers a more smoother, polished look and provide protection from abrasions. Explore our collection for eternity rings here. Michael Trio offers you the choice to customise your own ring design to suit your style and preference. Our team of designers will guide you along in your journey of creating something which no one else will have the same. We offer engraving services and couples can choose to have hidden messages/symbols engraved on the inner band of the rings, an intimate secret only known to both of them. Contact us today to discuss the possibilities and options of creating something unique to both of you. Arrangements can be made for an appointment at our office to discuss about your ideal design. Feel free to bring along any materials that’ll give us a better conceptualisation of your design. If you do not have any ideas, fret not. At our showroom, we have samples of products that you can view to form your ideal design. During this process, we can better understand your wants and you’ll have a better understanding on the costing, should you have a budget in mind. If you do want us to form the design you have in mind, upon confirmation, we will receive the deposit from you and our in-house designer will begin sketching the designs according to your preference. The designs will be sent to you via emails and our designer will make changes to the design to match what you have in mind. Alternatively, our showroom have samples of products that you can view to form your ideal design. For special customised designs, a deposit of $300 is required before we start on the process of designing.